This week we launched Transit of Venus | Venustransit at the Royal Society. One of the poets involved, Chris Price, has written about her approach to writing poetry for this unique project. An unlikely but marvelous conjunction: three New Zealand and three German poets, a bunch of high-flying scientists and the Tolaga Bay Area School and its community, all of us staring at the sun through our various lenses and filters. When Bill Manhire outlined the parameters of this project with the local poets, he suggested that we might like to write about ‘first contact’. 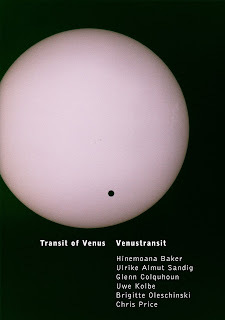 My version of that entailed bringing a rather fuzzy historical understanding into focus, as well as trying to acquire at least a basic grasp of the science of the Transit observations. I turned to Anne Salmond’s Between Worlds (Allen Lane) as my first historical source, where, predictably perhaps, I was drawn to the languages of the colonial and scientific enterprise, and what happened when they met the indigenous language. Alison Jones and Kuni Jenkins’ beautiful book Words Between Us – He Kōrero: First Māori-Pākehā conversations on paper (Huia Publishers) arrived just in time to provide a more fine-grained account. Hindsight and historians tell us that it all ended badly for the local contingent in so many ways, but at the point of first contact nothing was fixed or settled, everything was open, all of it was surprising. Of course good intentions proved wholly inadequate to the actualities of cross-cultural encounter back then, and while those intentions have had a few centuries to become more nuanced, I was interested in the sometimes uneasily prescriptive tone in which they are still voiced today. As well as the one found poem that made its way into the book, there was another reworking the Earl of Morton’s instructions on how to behave towards indigenous people, and a third that cut up the mission statement of the Hamburg Museum of Ethnology, where the poets performed. The ‘circle of least confusion’ is a phrase early Transit observers used to describe what they hoped to see in order to make precise drawings of the first contact between Venus and the circumference of the sun, but it had and has applications on the ground as well as in the sky. My own good intentions about not writing ‘history poems’ quickly foundered on the fascinations of research. What I wasn’t prepared for, though, was the positive-spirited ways in which the present-day community of Uawa /Tolaga Bay owned and expressed their part in the long experiment in biculturalism that began in 1769, which had the effect – as if Paul Callaghan, who was behind the Transit of Venus Forum, had somehow managed to engineer a momentary shift in the laws of cultural physics – of clearing a space in which the best available version of New Zealand could shine for a day, in the same way that the clouds parted at Tolaga Bay just in time to see the 2012 Transit. Maybe we all went back to being our unreconstructed selves next morning, but boy, it sure did generate a blast of hopefulness. Of course attention wandered to the peripheries. The poets’ visit to the Dark Sky exhibition at the Adam Art Gallery provided the raw data for both a solo mash-up (‘Venera: Fictions at an exhibition’), and a collaborative cadavre exquis poem-on-postcards that became ‘Dear Venus’. I sneakily initiated the poem with the opening lines of ‘Poedua’, which I’d already written, to find out where it might end up with two navigators at the helm rather than one: an experiment in giving up control of the story, at least in part. Elements of that exhibition found their way into other poets’ work as well. A front-of-house and behind-the-scenes visit to Te Papa yielded a response to John Webber’s painting of Tahitian princess Poedua. Somewhere between the Pacific and Webber’s Greenwich studio she acquired a rather English face and demeanour. It could be said that I have now matched that English face with an English voice by putting words in her mouth. The difficult negotiations continue. father was subsequently responsible for promoting Buller’s belated legislation to protect native birds. whanau when he was fourteen. He became a passionate scientist who conducted research from his bed after an accident on a climbing expedition left him paralysed from the neck down at the age of 21. He died at 32, and there’s an (as yet) unfinished piece of writing for Huia Onslow that haunts this selection. I hadn’t expected to find myself engaging with personal issues of (un)belonging as a result of my own Transit observations. It was both enlarging and unsettling – and being an observer-participant in the version of New Zealand culture showcased at the Frankfurt Book Fair, where the poets performed in an appropriately starry New Zealand pavilion, only extended the lines of questioning. Reading the poems in Germany proved a cross-cultural challenge, too. So much historical and scientific information that our audience would not have to help them make sense of the work. So much explaining to do, three languages, six poets, so little time. Mostly we had to just put the poems out there and hope they’d jump the language/culture barrier. But working with the three German poets, and in particular with my ‘partner’ Brigitte Oleschinski and our interlinear translator Catherine Hales was challenge as pure delight. All of us quite different, and yet in a way we all spoke dialects of the same language. Translation was an intensely pleasurable activity, especially with the support of the literaturwerkstatt’s sociable ‘VERSchmuggel / reVERSible’ process. None of this would have been possible without the complex interactions and efforts of the many organisations and individuals mentioned in the Acknowledgements of this book. Kia ora, a toast, and Prost to them all. Wunderbar. Watch It wasn't me || und du warst es auch nicht, a short film with Hinemoana Baker and Ulrike Ulmut Sandig from the Transit of Venus poetry project.